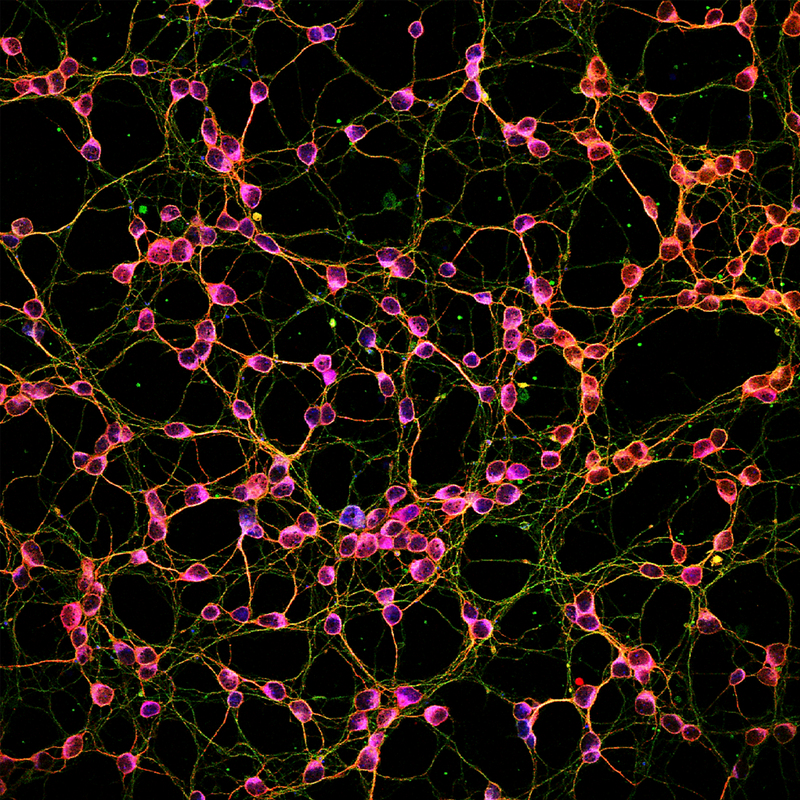 The CD171 (L1CAM) (L1 cell adhesion molecule) antigen is expressed by tetanus-toxin positive neurons, endothelial cells, certain epithelial cells, reticular fibroblasts, and several malignant tumors, including colon and breast carcinomas, colon melanoma, and tumor cells of neuronal and mesothelial origin. CD171 plays a vital role in cell adhesion and signal transduction, and has been demonstrated to play a role in augmenting tumor growth. It is involved in the development of the nervous system and regulates processes such as neuron–neuron adhesion, myelination, axonal guidance, and neuronal migration. CD171 (L1CAM) MicroBeads are designed for the separation of neurons based on the expression of CD171 (L1CAM), and especially optimized for use with dissociated postnatal CD-1® mouse brain tissue derived from animals younger than postnatal day eight (P8). Up to 99.5% purity can be achieved with P7 cerebellum tissue because the expression of CD171 is found almost exclusively on neurons. Purity decreases with age: P9 up to 80%; P12 up to 64%. For other brain regions, glial cells may need to be depleted if high purities are required. The CD171 (L1CAM) epitope shows papain sensitivity. Therefore, the Neural Tissue Dissociation Kit (T) is recommended to generate a single-cell suspension. (Optional) Myelin Removal Beads II, human, mouse, rat (# 130-096-433, # 130-096-733). DPBS/BSA buffer: Prepare a solution containing Dulbecco’s phosphate-buffered saline (DPBS) with Ca2+ and Mg2+ and 0.5 % bovine serum albumin (BSA) by diluting MACS BSA Stock Solution (# 130-091-376) 1:20 with DPBS. Keep buffer cold (2–8 °C). Degas buffer before use, as air bubbles could block the column. MACS Columns and MACS Separators: CD171 (L1CAM)+ cells can be enriched using MS or LS Columns or depleted with the use of LD Columns. Positive selection or depletion can also be performed by using the autoMACS® Pro Separator. Labeling Check Reagent-APC (# 130-098-892) to stain labeled cells for flow cytometry analysis. ▲ Note: The use of CD171 antibodies, clone 555, is not recommended for analysis of cells that are labeled with CD171 (L1CAM) MicroBeads. Learn more about our antibodies and dyes. ▲Note: Store antibodies in aliquots at –20 °C. To avoid repeated freeze-thaw cycles prepare working aliquots. Staining buffer: Prepare a solution containing autoMACS Running Buffer (# 130-091-221) with FcR Blocking Reagent, mouse (# 130-092-575) (1:10). DPBS/BSA buffer: Prepare a solution containing Dulbecco’s phosphate-buffered saline (DPBS) with Ca2+ and Mg2+ and 0.5% bovine serum albumin (BSA) by diluting MACS® BSA Stock Solution 1:20 with DPBS. Keep buffer cold (2–8 °C). Degas buffer before use, as air bubbles could block the column. Use the Neural Tissue Dissociation Kit (T) to dissociate brain tissue and prepare a single-cell suspension. Follow the protocol of the kit data sheet. Isolate CD171 (L1CAM)-positive neurons from the single-cell suspension using the CD171 (L1CAM) MicroBead Kit. Follow the protocol of the kit data sheet. To stain and analyze the isolated neurons by flow cytometry, follow the protocol of the data sheet for the Labeling Check Reagent-APC. ▲ Note: Use DPBS/BSA buffer instead of the buffer described in the data sheet. Take off the medium to remove non-attached and dead cells. Add 500 µl of prepared medium. Staining buffer: Prepare a solution containing autoMACS® Running Buffer with FcR Blocking Reagent, mouse (1:10). ▲Note: When working with CD68 antibodies, add 0.2% TRITON X-100 in PBS, incubate for 10 minutes at room temperature, and wash cells 3× with autoMACS® Running Buffer. Do not treat cells with TRITON X-100 before staining with Anti-ACSA-2, Anti-O4, or Anti-PSA-NCAM antibodies. Add pure antibody of choice in staining buffer to the cells and incubate in the dark. For incubation temperature and time as well as recommended antibody concentration, refer to the table below. Add a corresponding secondary antibody in staining buffer to the cells and incubate in the dark. For incubation temperature and time as well as recommended antibody concentration, refer to the table below. ▲Note: For co-staining with additional antibodies repeat step 6–9. Successful culture of CD171 (L1CAM)-positive neurons isolated from neonatal mouse brain tissue. P7 mouse cerebelli were dissociated using the Neural Tissue Dissociation Kit, and CD171-positive cells were isolated from the single-cell suspension using the CD171 MicroBead Kit. After 5 days culture in MACS® Neuro Medium, MACS NeuroBrew®-21, 1% P/S, and 0.5 mM L-glutamine, cells were fixed and stained with the neuron-specific antibodies Anti-MAP2 (red) and Anti-TuJ1 (green). P7 mouse cerebelli were dissociated using the Neural Tissue Dissociation Kit, and CD171 (L1CAM)-positive cells were isolated from the single-cell suspension using the CD171 (L1CAM) MicroBead Kit. After 5 days culture in MACS Neuro Medium, MACS NeuroBrew-21, 1% P/S, and 0.5 mM L-glutamine, cells were fixed and stained with the neuron-specific antibodies Anti-MAP2 (red) and Anti-TuJ1 (green).